Well, I'm exhausted, but I need to catch up on my reviews on here. 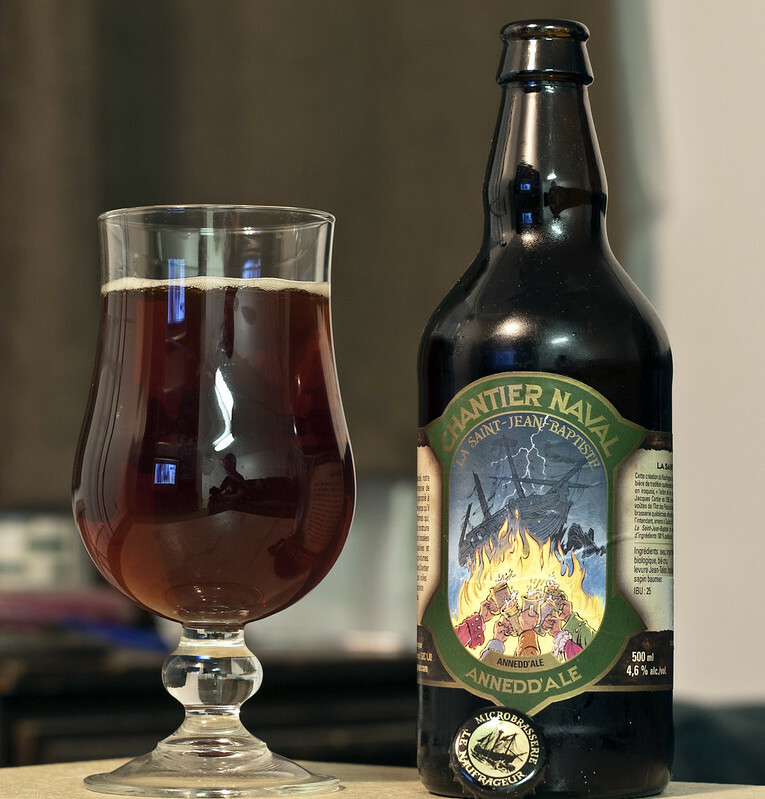 Here's a beer I purchased in Quebec City just over a year ago now: Chantier Naval La Saint-Jean Baptiste rousse Annedd'ale by Microbrasserie Le Naufrageur out of Carleton-sur-mer, Quebec. I'm not familiar with this brewery so I always enjoy trying new beers from breweries I'm not familiar with! Appearance: La Saint-Jean-Baptiste pours a rich cherrywood red, a bit too dark to be clear. A nice amount of creamy beige head glistening on the top. Aroma: The very first thing I noticed.. notes of caramel malt, raisins..! lots of raisins! among other dark fruits. Some light piney bitter hoppy notes intermingling in there, but fairly sweet and reminiscent of some British Red Ales. Taste: A nice balance between bitter and sweet, a moderate amount of bitterness from the hops giving it a bit of a spruce-like flavour to it followed by the sweetness of raisins, caramel and a certain amount of grainy cereals. Overall Thoughts: Had to keep this short as I'm exhausted beyond belief. La Saint-Jean Baptiste (Annedd'ale) is 4.6% ABV and is only brewed in batches of 50L, so you're guaranteed to be getting a taste of true quality! Loving the flavour of the dark fruits, and surprised by the subtle woodsy bitterness that makes its way through the beer the more I drink it. Was brewed on.. February 14, 2013! Valentines Day! Has a great British red ale sort of flavour to it, not too strong but a nice beer to enjoy after an incredibly miserable long day. The beer uses only organic malted barley and it shows! True quality beer. 25 IBU, 500mL bottle.